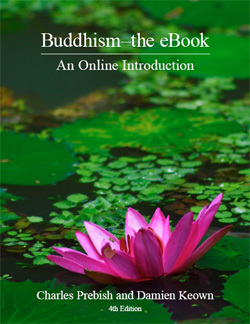 Extensively revised and updated, Buddhism–The eBook, Fourth Edition is a self contained textbook for an introductory course on Buddhism. Designed for undergraduate level study, it provides everything students and teachers could expect from a printed text and more. Buddhism Online. A website dovetailing with the ebook and providing a range of additional resources for students and teachers. "This is a wonderful resource. It's clearly written, authoritative, and covers everything I'd want to look at in an introductory Buddhism course. Because it's in electronic form, it can be accessed anywhere a student has access to a computer, and the hyperlinks open up a wealth of useful resources and information. This is the wave of the future. Our students are used to accessing information over the internet and reading text on computer screens. The links to websites and the book's homepage are invaluable, and make it much more than your average introductory textbook. Prebish and Keown are to be applauded for their pioneering efforts in this project!" "An invaluable new learning tool for introducing Buddhism. It surveys the entire tradition--giving welcome attention to contemporary developments--but it does so much more. It liberates students from the tedium of flipping pages and connects them immediately to carefully chosen riches from the net. Whether we're in the Ivy League or a community college, our students have been waiting for this eBook. Prebish and Keown have taken a visionary step. Links, pictures, online resources, and price, this eBook shows us the future of academic publishing. There's no good reason for students to be forced to buy an expensive stack-of-paper textbook anymore when they can have all this, instead. Prebish and Keown have taken a visionary step and we can take ourselves and our students along with them." "I think it is a great idea and surely an early entry into what will be the wave of the future; it's a pioneering effort and a strong base on which to continue to build an ever-increasingly sophisticated introduction to Buddhism."